Acclaimed Welsh language author Tony Bianchi has died aged 65. Mr Bianchi, originally from North Shields in Northumberland, learnt Welsh at the University of Wales. He published numerous novels in Welsh ‒ Esgyrn Bach, Pryfeta and Chwilio am Sebastian Pierce ‒ as well as short stories and won multiple prizes for his poetry. Mr Bianchi, who lived in Cardiff and was the Arts Council of Wales' former director of literature, died on Sunday. 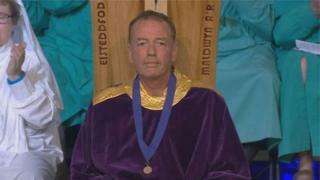 A spokesman for the National Eisteddfod described his death as "a great loss to literature".